After Halloween, I had a big pumpkin that I wanted to breakdown into pieces that I could consume. It was a very fun and rewarding experience. And it was shocking home much pumpkin you got from just one little pumpkin! If you are looking for cost savings meals in the fall, definitely consider buying pumpkins. 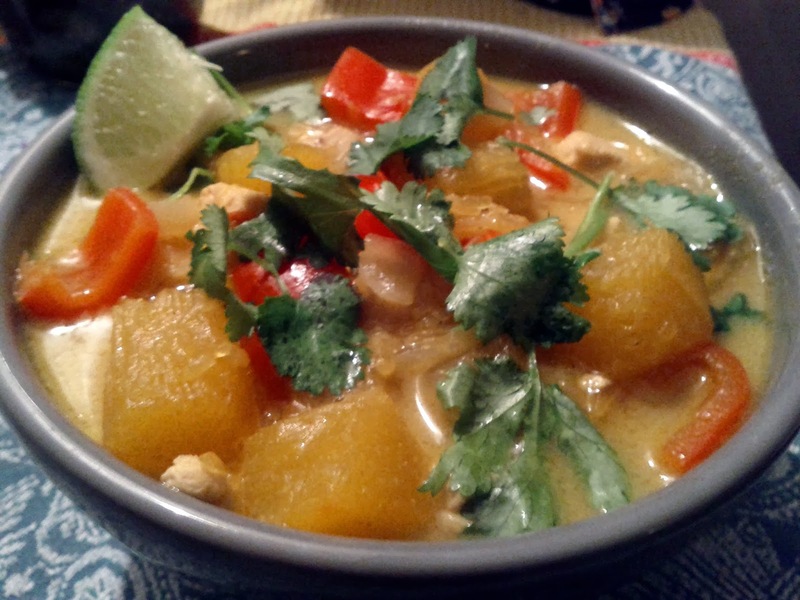 The pumpkin was also a great ingredient for a coconut curry. You could also use sweet potato as well. 1. Dice up some onions, and put them in a medium size to large pot in some oil or butter. Start to cooking the onions down until they become caramelized. While the onions are cooking, prep your other ingredients. Make sure you have your pumpkin in cubes, maybe 1 inch wide. Also some red pepper. If you haven't done so already, you could cook the chicken breast in the oven before hand and cut that up. Or you could cut the chicken and put it in the curry at the same time as the pumpkin. 2. After the onions are done cooking, you can add your spices, and garlic to them. Heating the spices will help reinvigorate them. After a few minutes, add your coconut milk. If the coconut milk doesn't look like enough, you can also add a little chicken stock to stretch it out. But don't add too much or you'll lose the coconut goodness. 3. Toss in your pumpkin, chicken, and red pepper at this time. And turn down to medium heat. Let it simmer and cook the pumpkin through. Maybe 15-20 minutes. 4. Once the pumpkin has cooked through taste the curry. Is it salty enough? Is it sweet enough? Is it spicy enough? There is a good chance you might want to add some salt, brown sugar, or cayenne pepper just to get it right. 5. Once the curry is done. Spoon it into bowls. You could eat it with rice. But definitely eat it with a squeeze of lime for some freshness and acidity. Also, some chopped cilantro.